Referred to in the newpapers as the Beau Brummel of gangland. The reason being of Ammatuna's fine dress and taste in clothes. For those who wonder what the term Beau Brummel means, it's in reference to an 18th century english fellow who took five hours to dress and also being the first to put a tie with his suit. He used to polish his shoes with a vintage champagne. In Ammatuna's case, it was because he took meticulous care in his appearance and clothes. This wasn't always the case. Ammatuna came from a poor fishing village in the South of Sicily named Pozzallo. 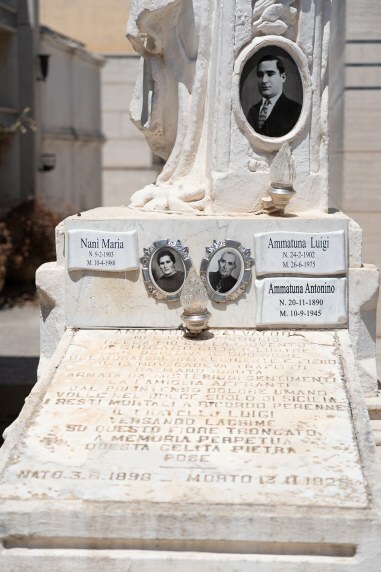 Little Salvatore made his way to the U.S. with his dad, Orazio Ammatuna back on April 6,1914. They had left the port of Messina on the boat called the San Giovanni. 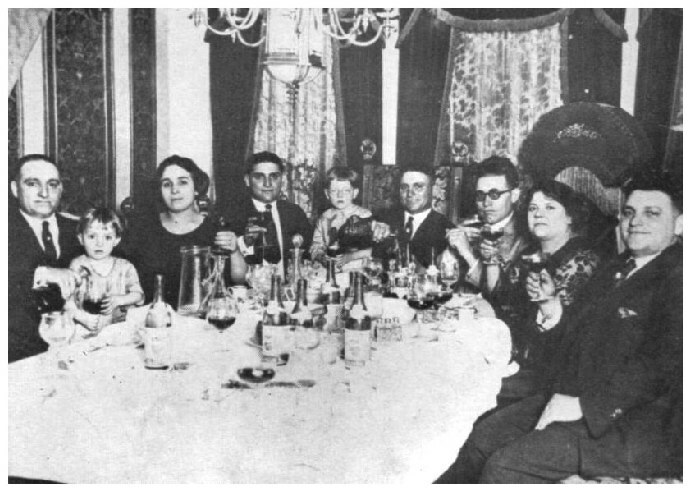 Little Salvatore's mom Lucia Modica stayed behind, until she too made her way over to New York in December of 1916. Dad and son had no education,not knowing how to read nor write, both made their way to the promise land in search of new opportunities. Sal at the age of 16, was already listed as an experienced mariner and his dad as a simple labourer. Hanging around the Sicilian element, Ammatuna figured out that the U.S. was not as welcoming as the stories told back home. Fortune was made by those who took charge. Salvatore made his own way to the bustling city of Chicago, leaving his dad and mom toiling in New York. Sal began hanging around the Sicilian bad men in Chicago. He would shoot craps and discuss ways of making money. He became muscle and touted the virtues of his choice for siding with alderman Anthony D'Andrea. Sam buys the Bluebird Cafe and is arrested there on March 14,1921 by police for killing rival Alderman Paul Labriola. No proof comes of this and he is released. Sal knew that the Sicilian community in Chicago was ripe for the picking. It's Unione Siciliane organisation was growing with every member arriving to Chicago via New York's Ellis Island. For a small yearly fee, the Unione promised the newly arrived Sicilian immigrants help in finding jobs, lodgings and medical insurance whilst living in Chicago. This was at first a real noble cause. As with everything, it wasn't long before criminals figured a way to angle themselves into the lucreative beneficial and fraternal organisation. The criminal element, through the power of Terrible Gennas, made it that a lot of the newly arrived were shaken down to pay tributes of money or favors in order to stay in the U.S. Sometimes the new immigrants faced death from their own countrymen. The new countrymen's jobs supplied through the Gennas dealt in risking their lives by cooking alky in their already cramped quarters. Sometimes they faced being detected by police through the smell of the cooking rotgut. They also faced an even worse fate if the makeshift still blew up killing everyone in the room. The Genna men gathered during a family reunion. Left to right: Sam, Angelo,Peter,Tony and James. Ammatuna settled in the Sicilian community on Taylor street. Together with the Gennas they forged a strong combine to compete against rival gangs from the North and West. There was the impression that the Gennas made the gang as powerful as it was, but Sam Ammatuna had a greater role in making the Genna bootleg operations as successful as it became. Often refferred to as a Genna enforcer and bagman, it was Ammatuna who showed the Genna's how to apply tact and money to get the job done. He was sort of the Torrio of the Genna gang. The Gennas also employed two newly arrived Sicilian killers by the names of Albert Anselmi and Giovanni Scalisi. These two were to later defect over to the Capone side after the Gennas were decimated. 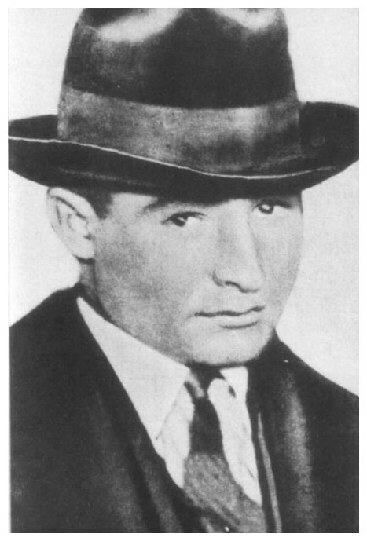 They were eventually killed when their hats got to big for their heads in trying to buck Capone. Their take over coup was found out. Ammatuna always boasted he never needed a gun and often walked around without one. Known as an avid opera lover, Samoots always attended them, especially when the Italian Opera company was in town. He would dress up to the nines, even wearing a silk scarf and bring his opera glasses for perfect viewing. Ammatuna was also known as a very generous human being. He would help out any friend who was in need and cost was of no matter to him. When he bought suits he always bought one for whomever went with him to the tailor. He also frequently paid shaves and haircuts for all the boys on the street. Pretty rich for someone who touts himself to the police as a simple furniture dealer. In March of 1924, Samuzzo funds and promotes a fencing match at the Ashland Boulevard auditorium. He personally wagers $20,000 on the match that his favorite, Italian Gianginto Sanges would win against the Spaniard Joseph Torres. Sanges wins the match. Making Samuzzo lots of money. Examples of his spending were of course on clothes mostly silk shirts, socks, suits, undergarments, diamond pinky rings, stick pins, shoes and fine hats. 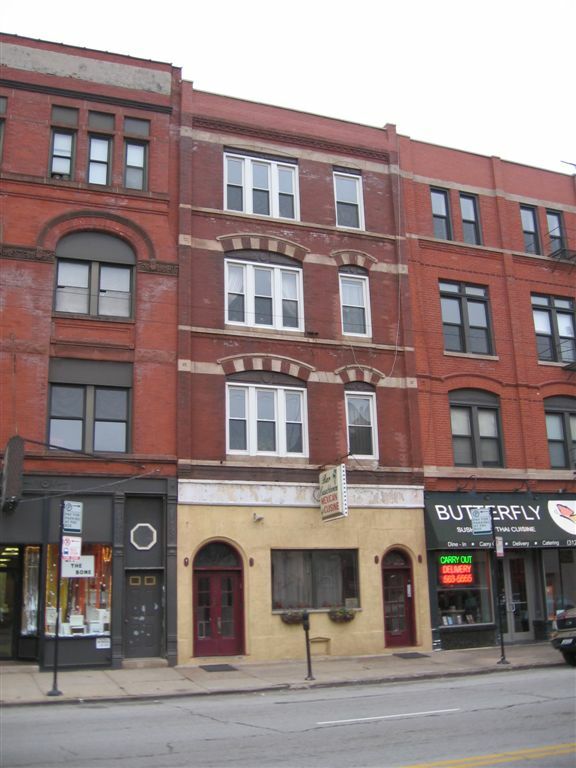 November 10,1924, three men enter Dean O'Banion's flower shop on State street. They have come to pick up flowers for Mike Merlo's funeral. Witnesses have Angelo Genna, John Scalise and Salvatore Ammatuna at the scene when O'Banion is shot and killed point blank in his shop. The Northsiders will keep Ammatuna on their list. This kindness eventually lead him into financial straits. At the time of his death, Samoots was reportedly $20,000 in debt. This was in most part due to the destruction of his stills, which was brought on by the death of two officers. This wrath cost Ammatuna plenty! One time Ammatuna supposedly became incensed when one of his many silk shirts returned from the Chinese laundry with a scorch mark on it. It was said that Ammatuna went back to the laundry shop giving complete hell to the owner. The owner probably didn't understand, so Ammatuna borrowed his friend's gun and shot the laundry man's carriage horse in retaliation. Nice story, but I still have no evidence to that. June 13,1925, Scalise, Anselmi and Mike Genna partake in gunfight with police and end up killing two officers. Anselmi and Scalise are caught. Mike Genna is killed after a police bullet rips through a main artery in his leg. Sam Ammatuna is sought. People have claimed to have seen him moments before in the gangster car. 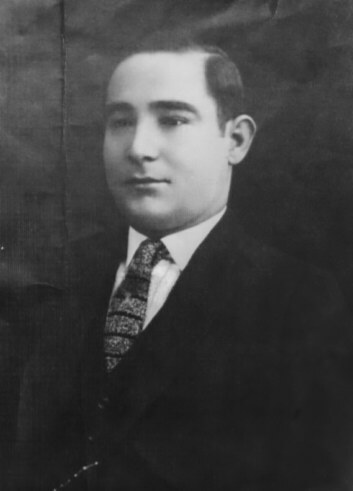 Ammatuna is arrested on June 27,1925 in company of Joseph "Pino" Massei at his his once owned restaurant (Citro's Cafe). After intense questioning by Chief of Detectives William Schoemaker, Ammatuna is released and not charged with any crime. Papers and cards are found on Massei linking him to the Genna alky ring. From these notes further raids are conducted. Captain John Stege and his detectives are coming down hard on all the gangs after the two policemen were killed by Albert Anselmi, Mike Genna and Giovanni Scalise. Alky cooking stills are smashed, especially on the little Sicily side of town. Appartments on Taylor street are searched. Anselmi and Scalise, facing the death penalty or at the very least, face long prison terms now go on trial. The now corrupt Unione Siciliane is used to amass funds to help Scalise and Anselmi get off scot free. The Genna army go out to collect more money for this cause. They especially go after Sicilians who arrived as immigrants, but are now successful businessmen. They shake them down for Anselmi/ Scalise defense funds, not once, but twice. Those who refuse are killed. troublesome gang quarrels. Samoots loves her, but also sees a higher calling in ascending to the Siclian leader throne. Samoots often calls on his sweetheart to profess his love and shower her with gifts. The promise of a wedded bliss is soon approaching as Samoots had asked her hand in marriage a year ago. Their December 1924 wedding was postponed due to Mike Merlo passing away in November of that year. Will it finally happen now? Not unless fate rears its ugly head again. On November 10,1925, Samoots prepares for an evening at the opera. He visits his sweetheart ,then visits the boys, and in the evening heads on over to his favorite barber shop at 804 West Roosevelt Rd. He enters and recognizes a few of his fellow Sicilians outside and inside the crowded place. He asks for a shave and a facial massage before heading to an evening of anticipated opera. He is calm and everything is good. He will marry into power and will expand his alky business and start making big bucks again. He will visit Pozzallo once more, but this time a success in the eyes of his fellow Sicilians. There is talk in the barbershop, Sicilian of course, and some jovial laughter. sheet cover off his person. At 6:50 pm, he stands up refreshed and out of nowhere steps in two men firing pistols at Ammatuna. 8 shots ring out in the crowded barber shop, sending patrons scurring away and some dropping to the floor. They have nothing to fear, as the men gunning for Samoots know he is unarmed. This attempt on his life comes exactly one year after Dean O'Banion was hit. Northsider Vincent Drucci is suspected as the main shooter. Of all eight bullets, only one hits the intended target. It struck him in the neck and came out under the shoulder blade wounding the spine. The hitmen slowly back out and make a dash for their car parked at the curb and escape. Samoot's friend outside rush in and take him to the hospital. Samoots first orders them to stop at his cigar store at 814 Taylor street. After notifying his friends there, he was immediately taken to Jefferson Hospital. Police theorize as to why Samoots was shot. They stated it could have been several reasons. He could have been encroaching his alky business in forbidden parts of the city. He was said to be supplying cookers with equipment for alky cooking now in Melrose Park. Another theory was a $16,000 liquor truck shipment hijacked in October by Ammatuna's gang from another rival. There was talk of major objection by others vying for the throne Mike Merlo once held. Marrying Merlo's sister in law may have been a sticking point with some. Their wedding was supposed to have been a grand Sicilian affair to be held in Carmen Hall. A lot of money and preparations were set forth for the celebrated event. Now Samoots lay weakening by the minute. Doctors thought at first that he might live, albeit paralyzed. Now the prognosis looked grim. Samoots newly arrived younger brother Luigi was at his bedside crying. He lives at Samoots' home situated at 1209 Roosevelt Rd. Luigi was uttering death threats to whomever did this to his brother. He would get revenge. He stated in the papers that Samoots revealed the killers to him. This may have been all bravado as Luigi later quietened down all the threats. Number (4) is Fred De Cola standing in as interpreter for Luigi. De Cola ia also the undertaker that will take charge of Samoot's funeral arrangements. Samoots knew that his time was near when he whispered to his brother that he wanted to marry his dear Rose before he left this earth. Luigi had already began cancelling the original big wedding event. On November 12, Samoots urges it to happen at his deathbed.This would make him die happy and peacefully. His Rose was in a state of shock and crying uncontrollably since the news of Samoot's shooting. Lugi offers attending doctors Dr. Ronga and Dr. Moran $50,000, even $100,000 if they can make Samoots live long enough to go through the impromptu bedside wedding ceremony. It's all in vain, as Samoots passes onto the after life at 2:00 AM on November 13th. Instead of a wedding family and friends will now be attending a funeral. 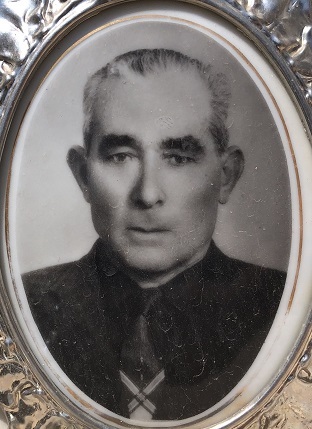 Luigi Ammatuna in later years. No killers were ever nabbed for the Salvatore Ammatuna murder. 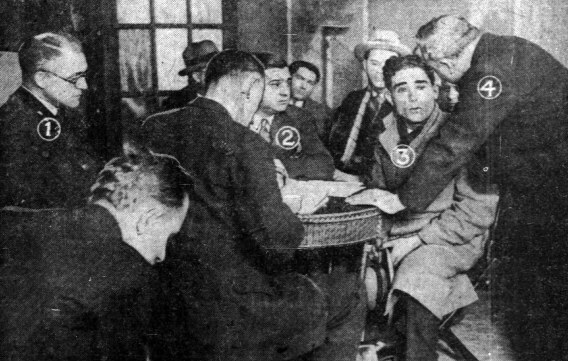 Some claim remenants of the Genna gang, O'Donnells and even Vincent Drucci. Samoots lips were sealed and so were Luigi's. Salvatore" Sam" Ammatuna's dream of making it only lead him directly to the Cook County morgue. An inquest was held and Samoots' body was taken to the morgue at Cook County. They signed off the case murder by persons unknown. 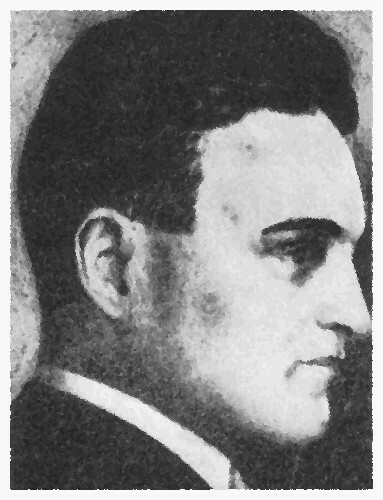 Detectives questioned his brother Luigi through interpreter and undertaker Fred De Cola. 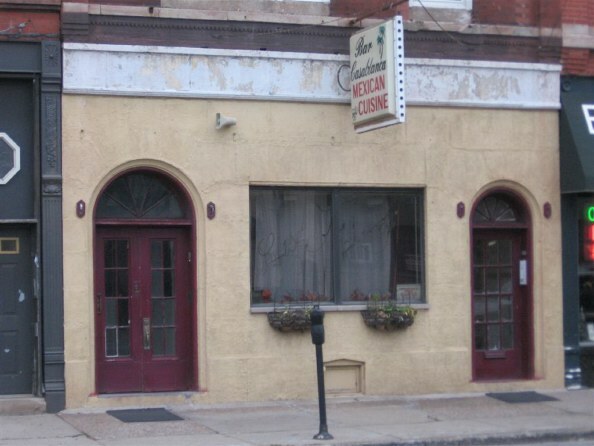 De Cola is the undertaker at 1158 West Grand avenue who prepared Ammatuna's body for the funeral.There was supposed to be elaborate plans for Ammatuna's funeral, but it was decided to be held at his sweetheart's home at 2128 Seminary Avenue. It was here where Samuel Ammatuna's body was embalmed. The wake for Samoots was held on November 16,1925. Many friends and family passed by the corpse that was dressed impeccably as he was in life. Flowers by the hundreds of thousands filled the home, balcony and backyard. Many were elaborate floral displays such as the gates ajar, Pillars of flowers, simulated monuments, harps, flying eagles, broken wheels and most touching was a huge anchor made from lillies of the valley and carnations. This tribute was from fellow countrymen who had also arrived to Chicago from his sea faring town of Pozzallo. Gestures of friendship from Diamond Joe Esposito and Sicilians from Taylor street. Samoots' funeral cortege passes through Little Sicily, his old Cafe, the Cigar store and also passes by the barbershop were his final destiny was dealt. Although the Catholic church refused a religious burial, the family managed to find a priest to do a graveside service. Samoots was headed to Mt. Carmel, but only for temporary storage. 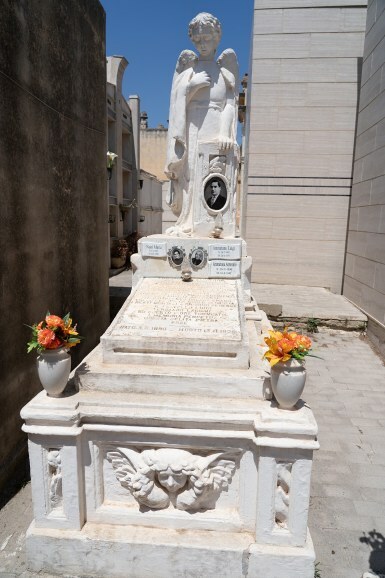 His body was heading home to Pozallo for burial in consecrated Sicilian ground. Other family members join Salvatore in later years. Inscription by his brother Luigi in memory of Salvatore Ammatuna. that was carrying his name as a good worker, intelligent and proud. On November 13, he was killed from an unknown armed hand and by mysterious emotions. The heartbroken family from their human pain wants to bury him in the beautiful land of Sicily. 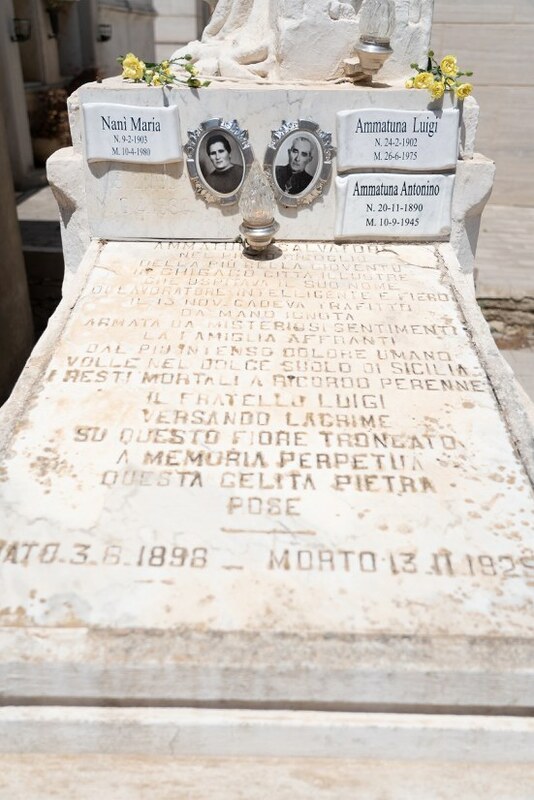 His brother Luigi, shedding tears of this cut flower to perpetual memory on this cold stone(tomb stone)."